‘Ginter Spicy White’ with a fully open bloom. Bill tells me the plant has set many flower buds to open next spring. We’ll keep you posted! 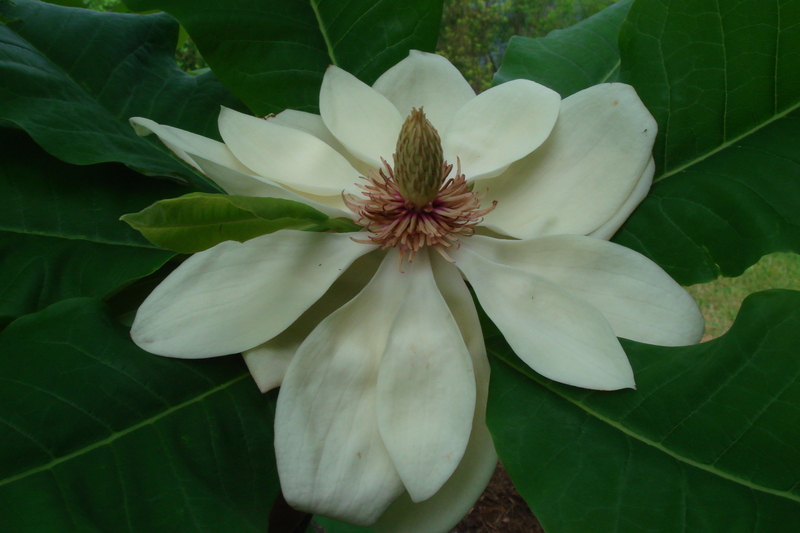 I just got word from our librarian, Janet Woody, a frequent contributor to this blog, that the magnolia ‘Ginter Spicy White’ is now officially registered as a new cultivar with the Magnolia Society International. ‘Ginter Spicy White’ was produced here at the Garden by volunteer Bill Smith, our resident magnolia hybridist, and was featured in the Fall/Winter 2012 issue of Magnolia, the journal of the Magnolia Society International. You can view the magazine in the Lora Robins Library. The tree is described as a cross between Magnolia Tripetala ‘Bloomfield’ and Magnolia ‘R20-1’ (Magnolia sieboldii x M. ashei). The tree is now 7 years old and bloomed for the first time last year. The blooms have a lemony-mint fragrance (hence the spicy) and the tree was named in honor of Lewis Ginter Botanical Garden and we are honored. The tree can be found in our test beds, near the irrigation lakes behind the Conservatory. Bill Smith is quite an amazing person. I first met and interviewed him about ‘Ginter Spicy White’ back in 2010 at the Volunteer FunFest — an event we hold annually to thank our volunteers. Here’s my conversation with Bill. I hope you enjoy him as much as I do. We’ll be sure to post photos so you know when it is blooming next spring!